I have never met Alison Sweeney. I don’t even know anybody that knows her. I have no reason to think she is anything other than a wonderful person. So it is irrational for me to be so annoyed by her ubiquitous presence. I read numerous magazines each month to generate writing ideas (which, of course, makes the subscriptions tax deductible!) and I swear she’s in every one. And not just a headshot or a quote from her – like four and five-page spreads! I’ve never watched either of her shows, but I know she has two and that she’s leaving one after twenty-one years because every magazine I read says so. If she were a song, she’d be an endless loop of It’s a Small World After All. So recently, as I tried to flip through yet another spread on her (with no end in sight), the letters BFF jumped out at me. I had to stop and roll my eyes at her use of the junior high cliche. But she was using it to abbreviate Best Fitness Friend. Oh. Hmmm. I had to admit that was a usable concept. We are often able to accomplish more of our fitness goals if we have a buddy going through the paces with us, cheering us on, and holding us accountable. (Sorry for prematurely judging you, Alison.) So let’s extend this concept just a bit further for GoalFest – because not all our goals are fitness -related. How about BGF for Best Goal Friend (which sounds better abbreviated!)? I was lucky enough to have one for the October goal and, even though we were on different continents and our goals were totally unrelated, it was fun to stay in touch, root each other on, and offer sympathy and even suggestions for some of our challenges. I highly recommend it! And for those of you who are internally motivated, self-disciplined and don’t need the support of a BGF to obtain your goal, you are probably just the person to be a great BGF to someone who could use one! My October goal was to get the old bicycle out, find a place to get it serviced, get it overhauled, and ride 20 miles. I achieved about 75% of that and learned some valuable lessons. I was able to locate a reputable place about a half-hour away, made the bike appointment, took it in, picked it up the following week. And then I rode less than 20 miles. I will never again use the expression “it’s just like riding a bike” when referring to something that’s easy to pick back up after a long time. I knew I had shrunk about an inch in height over the past few years, but I assumed it was in my back, not the length of my legs. But they clearly got shorter because I can only touch my feet flat by actually resting on the crossbar (I had to be cool and get a guy’s bike years ago) when standing. Being past childbearing years (assuming God doesn’t decide to prank me!) I am not as concerned about that status as I might have been a few years back. What I didn’t expect was the exertion involved in riding (after all, I had used stationary bikes through months of physical therapy after knee replacements) and total jelly legs after a mere 15 minutes of riding! I plan to stick with it, though. And I’m proud to say that my BGF, Pauline King, hit 100% on her goal – completing a painting she had started some time back. If any of you read her blog post on wanting to cultivate the magic in her life, you’ll see she accomplished some of that in her finished work of art! NOVEMBER GOAL: This may sound odd to you, but I am committing to not sitting consecutive hours without getting up and standing/walking for a few minutes every 30-40 minutes. I’ve seen almost as many articles on the danger of sitting too much as I’ve seen about Alison Sweeney. Doing so makes one much more vulnerable to stroke and heart attack. Between sitting in the office, sitting in court, sitting in the car for long commutes and (for a change of pace) sitting and watching TV in the evening, I need to be deliberate about moving more. Studies have shown that even daily exercise does not counteract the effect of serial sitting. I want to cultivate the habit of regularly getting up and moving throughout the day, and being intentional about it for a month should help me accomplish that. My October goal was to organize one of my piles of torn out magazine articles/recipes/decorating tips and to finish an afghan I started for my daughter YEARS ago. I am pleased to report that I did indeed organize one of my piles and even started on a second. I loved re-finding all those articles I squirreled away and have actually used two of the recipes. 1 point!!! On the afghan, it is a 25 square piece finished by joining all the knitted squares via crocheting. I found 18 finished squares, completed two more, but sadly, am still in need of more time to complete. -1 point!!! I guess that leaves me at zero. The afghan is now definitely on my radar and my new goal for the afghan is to finish in time to included with my daughter’s Christmas items. NOVEMBER GOAL: This month, I would like to complete organizing my other pile of articles/recipes/decorating tips. It really was great to have them all in one container that allowed me to search and retrieve them sooooo easily. For the second goal, I have committed to 5 days a week of 3.5 miles walking each day. To help me stick with it, I can only read, knit, watch TV for 1.5 times the amount of hours that I have moved. Right now 3.5 miles takes me about an hour and 15 minutes. So I am allowing myself not quite 2 hours in the evening for my sedentary activities. I like the idea of having to earn my AIS time (a@! in seat time). If I combine knitting with watching a favorite show, I will feel even better – efficient at using my earned ‘down time’ :)!! FIRST: If you set an October goal, how did you do? Please let us know in the comment section if you are still in the process of obtaining your goal, if you have achieved it, and what you learned along the way. 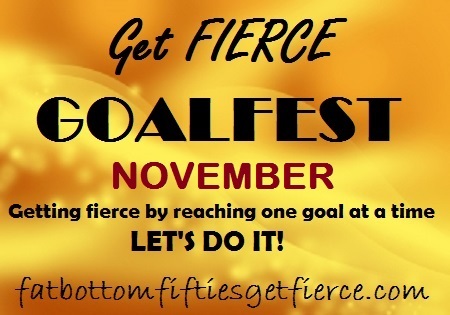 SECOND: Declare your November goal! You know putting it in writing makes it much more likely you will follow through! Tell us what you have planned! THIRD: Check out the Wailani site so you can be thinking about what flavor body scrub you’ll pick if you win the random drawing out of those who accomplished their October goals! The winner won’t be drawn until Friday to give everybody a chance to get their comments in. Click picture to check out Wailani’s Body Scrub flavors! FOURTH: Check in on Friday to see if you won!